Despite immediate backlash for Twitter's CEO after tweeting about the chain during Pride Month, and despite protests of its expansion into NYC, Chick-fil-A just keeps getting bigger. It's on track to become the third largest fast-food chain in the US, and for the third year in a row, it's been named that nation's favorite fast-food restaurant. That's according to the American Customer Satisfaction Index's annual study, which surveys 22,500 Americans on their experiences at chain restaurants. Participants rate chains from 0 to 100 on categories like food quality, restaurant cleanliness and layout, and waitstaff behavior, and this data is averaged out into an overall score for industries and for restaurants. 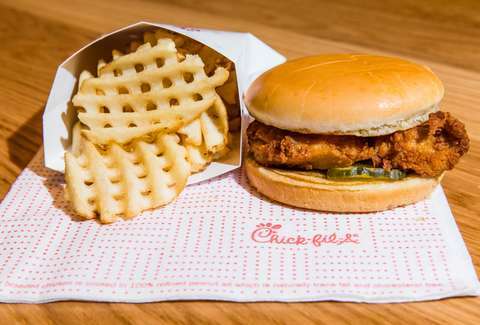 Chick-fil-A scored the highest with 87 out of 100, beating runner-up Panera Bread by a full five points. The fast-food industry in general was up 1.3% over last year's score, now at 80 points, which is good news for the in-a-hurry among us. For so-called full-service restaurants (aka sit-down), Texas Roadhouse came in at the top at 83 out of 100, four points behind Chick-fil-A. Considering that Chick-fil-A also topped Market Force Information's ranking of chicken quick-service restaurants, this probably comes as no surprise. Imagine how high it'd rank if it were actually open on Sundays.